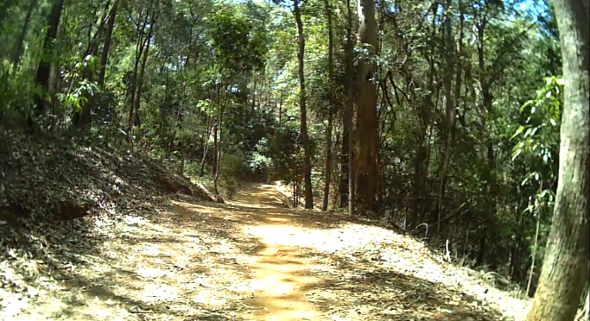 I’ve been eyeing off Brookfield and it’s surrounds for a while now and although I’ve ridden mountain bikes in the Brisbane Forest Park and Gap Creek Road for around a couple of decades now, I’ve only touched Brookfield very briefly in the past. Sunday’s ride was a bit of an impromptu affair so the photography is scant and this post will only be brief but I’m already planning a longer ride to Brookfield in the near future and will have my staff of photographers, editors and other minions at the ready to provide more extensive coverage. 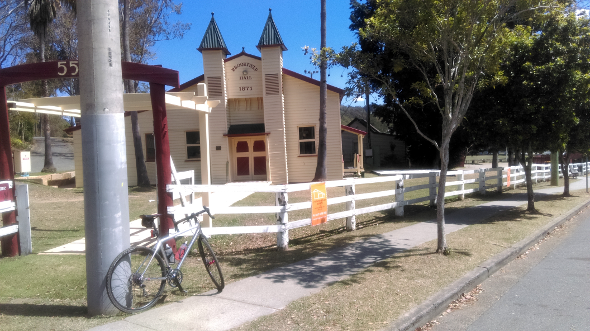 Nonsense aside, at mid morning, the Crossrip and I set off through Ashgrove’s various bikeways and back streets to Gap Creek Road where I made my way through the fire trails onto Boscombe Road and into Brookfield. Dillon Road and Gap Creek Road provided some good climbs and I rolled into Brookfield’s General Store just in time for lunch where I had one of the best home made sausage rolls I’ve eaten for a while. 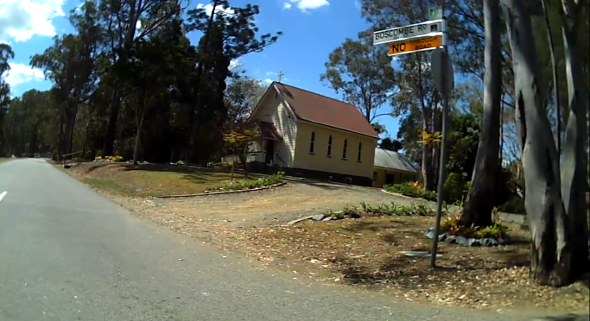 After a quick look around town (though Brookfield is actually a suburb of Brisbane despite it’s country town feel), I headed on through Pinjarra Hills and up Grandview Road where I hoped to make my way into the Moggil State Forest. By this point in my journey, the photography had really gone by the wayside but I can tell you that the roads up to and including Grandview Road are really spectacular to ride on – smooth, quiet country lanes amongst really picturesque countryside. Do remember though that people’s homes are nearby so if you ride out here with friends, try and keep the noise to a minimum (it’s quiet enough out here that you really don’t need yell “clear” at top voice). 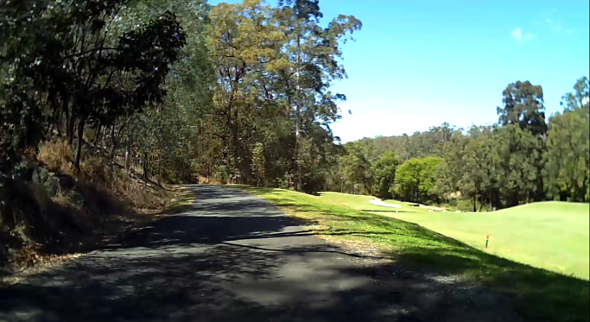 Sadly, when I reached the end of Grandview Road, I found that a certain popular mapping application had actually not been completely truthful when it indicated that I would be able to enter the Mogill State Forest from here. Instead I found a whole lot of long driveways and a surly looking pony milling around outside one of the properties. My affinity with horses hasn’t been great since, as a teenager, one that I was riding simultaneously sneezed and farted thus subsequently almost throwing me off so after a quick photo, I started retracing my route. 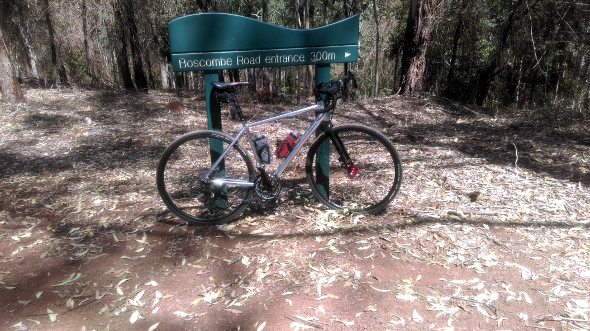 No regrets though, the ride out there was great and I will have to find a better way into the Mogill State Forest. By this time, the day was starting to cast some longish shadows and my legs where almost full of kilometres so I thought Queensland Railways could help me out with part of my journey home. The idea was a good one but choosing Mogill Road to get to the train station was not so great. 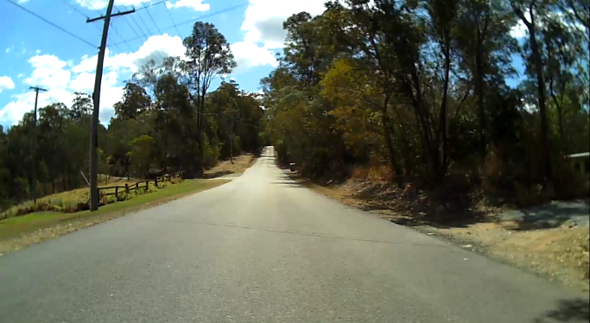 I’d go so far as to say that Mogill Road around Pinjarra Hills through to Kenmore is probably the worst I’ve ridden. There’s almost no shoulder most of the way, there’s a few scrappy bits of bike lane in some sections and the footpaths are narrow and rough. If I find myself out this way again, I’ll definitely be looking to get through the back streets and onto Fleming Road, Russell Terrace and then over to the Western Freeway Bikeway. Eventually, though, I found my way over to the Toowong train station where my train was only four minutes away. The almost empty Sunday train was a great way to end a great ride as I sat and pondered my next attempt at Brookfield. Keep on riding and enjoy the spring weather. Previous Previous post: Dirtbags Ahoy!